Beginning Ukulele, Intermediate Ukulele, and Mastering Ukulele together in one complete, comprehensive instruction book dedicated to revealing the secrets of the ukulele. Anyone interested in playing ukulele can pick up this fun, well-paced method and get started right away. Learn everything you need to know, including chords, strumming, picking, basic music theory, and reading tablature (TAB) and standard music notation. Featuring practice tips and other important issues for the beginning ukulelist, this comprehensive edition takes you from the absolute beginner level up to advanced chords and chord-melody playing. Play classics like "Amazing Grace," "Greensleeves," "When the Saints Go Marching In," and "The Star-Spangled Banner," and develop your skills to include jazz improvisation. Whether you are just starting to play ukulele or are an advanced player looking to improve your playing, this is the one book you need. Guitarists looking to expand their musical horizons will also find this to be the perfect introduction to the ukulele. 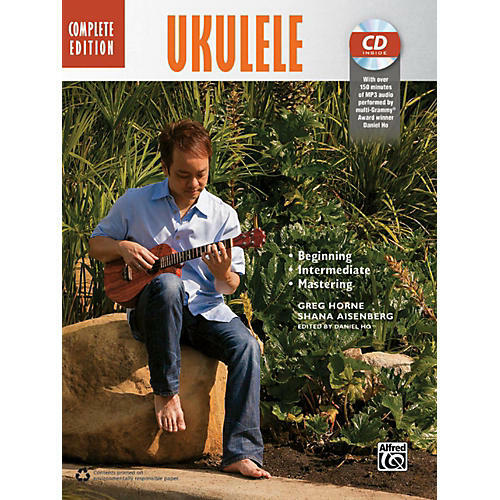 * Includes an MP3 CD with over 150 minutes of demonstrations by ukulele virtuoso Daniel Ho.